Michigan Rep. John Conyers, a leading Democratic congressman, is denying accusations that he made unwanted sexual advances to female staff members. 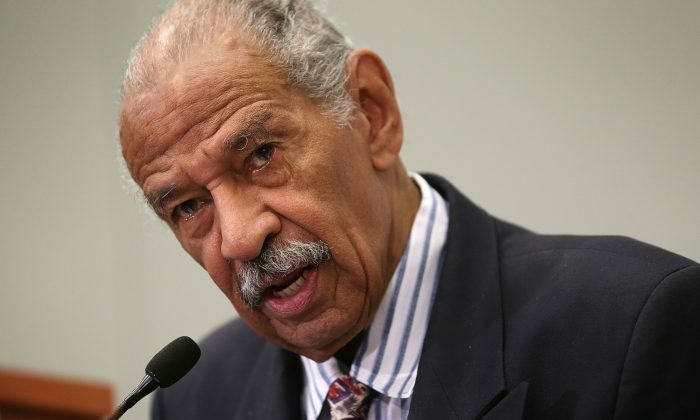 Conyers told an Associated Press reporter at the door of his Detroit home that he knew nothing about claims of inappropriate touching. He said he had been “looking at these things with amazement,” in reference to the accusations. Conyers denies having made such a settlement with any staff members. The article also cites the accounts of several other former staff members mentioned in the documents. The documents were first provided to BuzzFeed by independent journalist Mike Cernovich. Cernovich said in a video on his Twitter page that he had chosen to provide the information to BuzzFeed, rather than publish it himself, so that the story wouldn’t become about him. Allegations of sexual harassment involve a lengthy process and require the accuser to sign a confidentiality agreement. The woman in question was offered a settlement in exchange for her silence, BuzzFeed reported. In total the woman reportedly received $27,111.75 as a result of the settlement. Last week The Washington Post reported that Congress’s Office of Compliance paid $17 million to settle a total of 264 cases with federal employees. An unknown number of those cases involved accusations of sexual harassment. Conyers joined congress in 1965, making him the longest serving representative currently in the House. He currently serves as the ranking member on the House Judiciary Committee.